Before I give you my list of 10 tips, I would like to share the evolution of my ubiquitous capture tool (UCT) with you. I probably forgot some of the things I used as UCT, but here are a few. At one point I bought a stack of expensive Moleskines and used several of them as my UCT. This violates several of the rules described below: it’s expensive and it doesn’t invite you to create quick and dirty notes. Then I started to collect digital notes on my laptop (e.g. plain text files). Violations: not really portable, not simple and not quick. I used the same principle with my Windows Mobile PDA. Though portable, it’s not quick enough and certainly expensive. I finally settled on a small set of UCTs: scraps of paper (could be anything ripped to small pieces) and a simple pen; and sometimes voice notes with my mobile phone. It’s simple, cheap, quick, fun and they complement each other perfectly! If it takes too much hassle or time to even whip out your tools, you’re definitely not going to use them in the heat of the moment when inspiration strikes and you need to jot down something quickly. The same goes for cool but complicated tools, for instance a PDA. If it takes 3 minutes to jot down an idea because you insist on using a stylus to tap-tap-tap your note on your PDA, then pretty soon you will resist doing it at all! If you really enjoy using your tools to capture thoughts, ideas and other “stuff”, it is much more likely that you will actually do so when it is most needed. 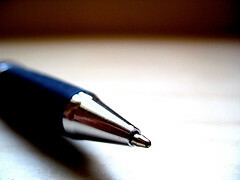 Using a nice pen, nice looking paper, or whatever floats your boat, will definitely motivate you to capture everything. I told you about my Moleskines. They are really, really nice! However, they are so nice that you want to write something nice into them as well. You start resisting jotting down a quick note or two, because after all a Moleskine deserves better, right? Wrong! You need to start using tools that are cheap and dispensable so you won’t resist taking any kind of note that crosses your mind, when it crosses your mind. If I use simple scraps of paper and a very cheap pen to capture my “stuff”, I don’t really care about losing my pen or writing neatly. Remember the principle is actually ubiquitous capturing. That means you want to use tools that can be carried with you anywhere. When I was still using my PDA for capturing things, I didn’t take it with me everywhere. Sometimes it just didn’t fit my pocket or I was worried it would get stolen. Once you catch yourself leaving your UCT at home once in a while, it will be the beginning of the end to ubiquitous capturing! My ubiquitous capturing has become so convenient and so simple since I started using a simple pen and some scraps of paper, that I can’t really imagine using something else anymore. What’s more, I started building in redundancy by leaving scraps of fresh paper and some pens around the house, in my car, at my office, in my pocket and in my bag. You will not ever catch me without a pen and paper, either on me or very near to me! Don’t use too many different UCTs. However, sometimes different situations call for different UCTs. You won’t catch me writing down stuff in my car, well, not very often anyway! The funny thing is that in my car I have time to think or make a few phone calls and I actually need to capture a lot of “stuff”. Here’s my solution. I created a small set of tools that complement each other. I’ve mentioned pen and paper a couple of times for ordinary situations, but in my car I use my mobile phone to record voice notes. Now I have truly ubiquitous capture (except for the shower!). Now that your capturing phase of the GTD workflow is starting to become really smooth, you don’t want to create a new bottleneck downstream. Make it a habit to process all the stuff you’ve captured at least once a day. If you collect too much before actually processing it, you will start resisting taking more notes! In order to optimize your capturing experience even further, it might be very useful to create your own (simple) notational system, consisting of symbols, abbreviations or any other thing that speeds up writing stuff down. For instance, I use the @-sign to indicate that I need to email something, I use an arrow to indicate actions or commitments, I use “vm” to indicate a voicemail, et cetera, et cetera. Use what works best for you! This little tip is going to save you more than once, believe me. Most of the time it is not important when something happened, but there will be occasions when you will be glad you can faithfully reproduce the exact date when something was promised, decided, or even given to you. The effort of writing down the current date on your note is small compared to the huge, potential benefit of this. Try it and let me know if it works for you too! My final tip for now has to do with people who give you a funny look when you whip out your UCT in the middle of a conversation. I can imagine a few situations in which I would feel awkward or inhibited to use my UCT. Explaining GTD is sometimes uncalled for or simply too much work. What works for me is the following. If I get a funny look when I whip out my UCT and take a quick note, I always tell them: “Hold on, what you’re telling me now is so funny/important/interesting that I don’t want to forget it!“. It works every time! * Ask the Reader – Favorite Ubiquitous Capture Tool? If you liked this post I would definitely appreciate it if you shared it on del.icio.us, StumbleUpon or on Digg! If you want a cheap and highly portable solution, I’d suggest going to pocketmod.com [link: http://www.pocketmod.com/v2/ ] and customizing one that suits your needs. @gtdfrk: Great tips, and better for the completeness of this as a set of tips. The datestamping is a gem of a rule, and one I’m not habitual about yet–and I need to be! 1. Shorthand is good, but make sure you give your future self enough context and explanation to make sense of what you’ve written (A good 43 Folders article from Merlin Mann on the subject. 2. Having discreet pieces of paper (or whatever) for each discreet item is a must. I get myself in trouble often when I write notes about six different things on the same sheet of paper. Now I can’t file it, move in through my system of trays and folders, or easily track what’s complete, what’s half-complete, and what’s unstarted. Again, great tips. FWIW, my favorite ubiquitous capture tool is blank business cards. I buy a box of 1,000 blank business cards and keep some on my desk, in my wallet, wherever. They’re great because they’re the right size, but they’re heavy enough that they won’t get destroyed in transit. When I’m out and about, I typically capture something by pulling a blank card out of my wallet. When I’ve written on it, I put the card in my front pocket. That makes my front pocket a sort of “inbox” (a funny thing to say) that I can process when I get back to my desk or get home. Great additions, thanks a lot! I certainly agree with having 1 single item on 1 single piece of paper. It’s also one of the rules I violate the most and curse myself for doing so later (when processing). My capture system looks like yours. I have fresh scraps of paper in my back pocket and scraps with notes on them in my front pocket. Great post. I think a lot of us get bottlenecked at #7. My current strategy, which has its advantages and disadvantages, is to label different Steno (I can’t use regular paper anymore, I swear!) by what type of stuff is supposed to be in it. I’ve got a “Charlie” pad, a “Music” pad, a “Military” pad, and a “Home” pad (for stuff that’s shared with my wife, i.e. grocery lists, plans for the basement, etc.). I’ve done it this way so that I always know where my notes are, based on the type of information. Of course, it’s bulky as hell, and sometimes I write the wrong stuff in the wrong notepad. And having four pads can be a pain. It has helped me not get frustrated at flipping through one notebook to look for information, though. The physical writing process helps me remember things better for some reason. I’d like to come up with a better system, but this is the best that’s worked for me thus far. That’s pretty extreme, having 4 different pads! But hey, if it works for you then that’s great! Do you keep your captured notes in these notepads or are they torn out and processed and organized into the rest of your GTD system (like, perhaps, a paper-based reference system)? Physical writing is great! Combining visual and tactile senses is always a great idea when it comes to remembering things. Try adding the auditory component by reading your notes out aloud to yourself for an extra boost in memory! Great post. Numbers 1 and 4 are why I don’t own a PDA. Sure, you can get a keyboard for your PDA for easier typing instead of using the stylus, but who wants to carry around extra hardware in order to jot things down? @Charlie: I agree that’s pretty extreme with the 4 pads, but go with what works until you find something that will work better. My boss uses a single junior legal pad as his only capture tool, and I can tell you that becomes a mess! Each of your Steno pads seems essentially like a context list (next actions) or an agenda list (also next actions), plus probably a bit of project list mixed in with each, too. I simply use a planner binder and a separate sheet of paper for each context list or agenda list. That keeps it separate enough for me. Thing is, since it’s a whole planner, it probably ends up being bulkier than your steno pads, even though I’m using fewer sheets of paper! But, you may want to find a way to separate projects from next actions in each steno pad. Perhaps you can write your projects on the inside of the front cover (and your next actions on the actual paper). By the time you run out of room, it may be time for a fresh pad anyhow. I’m road testing OmniFocus on the iPhone. Superb program on the Mac, but it is the early stages of release and is a bit rough yet. It has a excellent feature though that I think is the future of GTD, location aware contexts. You hit the location button on the iphone which uses GPS or cell towers, and up pops all the next actions listed in order from closest to furthest away. It is truly awesome. I gotta plug the Levenger Pocket Briefcases, which use 3×5 cards and have a writing surface, and from 1 to 3 pockets depending on which of them you pick. The Pocket Briefcase combined with OmniFocus (once they get the kinks worked out) are a killer ubiquitous capture combo. for others and they each love them. Personally I hate little slips of paper, and since I always have my phone with me, I’ve lately been using Jott.com almost exclusively. You call, leave a voice message, and the voice recognition system converts your message to an email sent to you or any of our contacts. Its brilliant and simple. Speaking clearly helps the system to not misunderstand, and you can always spell things out. Converting voice to text completely eliminates hand written notes and you can use the Jott website to create all the lists you need to have and print. Give it a try, the basic system is free. Great article, i totally agree with you. My system is quite the same you described, just slightly different. I use scrap paper to ubiquitously capture things and ideas and, in order to be green and not to waste paper, i usually like to write on the back side of shops’ receipts. Here in Italy you get them averytime you buy something in a shop: the front side is obviously printed, but the back is white. So why not to take advantage of this? They’re small, different sized, paper quality is different from one to another, and they can comfortably stay in your pocket. Moreover, they’re more than free. I also use a moleskine for capturing ideas, but i use it more to think about thing i have to do, projects, and so on: it’s more mind mapping than capturing. I surely agree with containing one solitary item on 1 single portion of paper. It’s too one of the regulations I defy the most as well as nuisance myself for doing so afterward. A diver’s kneeboard & chinagraph pencil – works perfectly under water! I realise this is a very old post but I want to recommend MailMe Voice as a simple iPhone note taking app. When you start the app it automatically starts to record and when you tap send it sends the voice recording to your e-mail inbox. Can be used with just one hand. This blog seems as very interesting reading now when I’m in my GTD childhood.